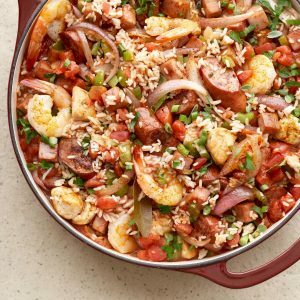 One pan Jambalaya is classic Creole cuisine. Make it your way for an easy meal everyone will love. Heat oven to 350°F. In a 4- to 5-quart Dutch oven, heat 1 tbsp oil over medium-high heat. Add chicken and cook, turning about 4 min; transfer to a plate. Add ham and sausage; cook until lightly browned, about 3 min. Transfer to plate with chicken. Add remaining 1 tbsp oil to Dutch oven. Add onion, celery and garlic; cook until just softened, about 4 min. Stir in rice, tomatoes, broth, bell pepper, Cajun seasoning, bay leaves and meats and bring to boil. Cover and bake until liquid is absorbed and rice is nearly tender, about 35 min. Add shrimp, pushing into the mixture, then cover and bake stirring once, until shrimp is opaque, 5 to 10 min. Discard bay leaves. Sprinkle with parsley and scallions. The holy trinity of starters, celery, peppers and onions, gets this Cajun dish going. With a mix of chicken, sausage and shrimp it's one fantastic dinner. This thick stew of rice, meats, tomatoes and tons of flavor hales from Louisiana, with Spanish and French influence.